CARIS Islington is the oldest churches winter night shelter project in London. Their work is much needed as according to Homeless Link the number of rough sleepers in this country has risen each year since 2010. Last February the Department for Communities and Local Government released the 2014 figures on homelessness across England, showing that more than 2,700 people slept rough on any one night; this was up 14 per cent from the estimated number of rough sleepers in 2013. London is the second most affected area with around 700 people sleeping on the streets every year. CARIS Islington provides around ninety guests with a bed and two free meals a day during the winter time. “We became an official charity in 1996, before then we were doing very small scale bereavement counselling for adults and there was an entire group of CARIS projects in the capital. They all broke off and became their own registered charities twenty years ago. We kept the name CARIS and within a coupke of years started running the cold night shelter", said Rachel Smith, 24, one of the two shelter coordinators, along with Mark Brennan. “The majority of homeless people we receive tend to be single man or women between the age of 20 and 60. We see lots of them when we walk on the street because according to local councils, they ‘can cope with being homeless’. “We open January to March and each venue holds an average of fifteen guests a night; they normally stay for twenty-eight days and depending on how they are engaging with us over the first week, they either remain for a longer period of time or leave earlier. CARIS night shelter consists of eight churches, each of them offering winter shelters on a specific day of the week, with two venues available on Fridays and so we can accommodate more people just for that night. Overall we had 88 guests staying with us between January and March this year”. “We’ve got over six hundred volunteers across all the venues and that includes people who cook the meal beforehand and clear up after, those who set up the beds, volunteers who are there to welcome the guests and sit with them throughout the meal, others who will be staying overnight and those who will be there to do breakfast. They are fantastic and make it very easy for Mark and myself to do our job, because they have been doing it for so long that each church has a volunteer coordinator who will arrange the rota for each day. “We get local schools involved as well: pupils have home economic classes where they learn how to cook and on Tuesdays they usually drop at the night shelter whatever meal they have prepared on that day”. It is all very well coordinated at CARIS Islington, which has been contributing to the community for nearly two decades. However, what does happen to the homeless people of North London between April and December and how does the charity operate, meanwhile? “The shelter is not open between April and December, so our aim is to get people to move on into temporary accommodation or private rented accommodation, while they are still in the shelter with us. When we cannot help them directly, we try to refer those guests to agencies who deal with their specific complex needs, so, if they have a drug and alcohol addiction, we will send them to a drug and alcohol rehabilitation agency or charity that deals with housing clients having that specific issue. “During the summer Mark and I work with people who have left the shelter in March and bring few of them on holiday, to get some time away from being a rough sleeper in London”, emphasised Rachel. “We do our best but this is a funded project and we normally tend to get financial support both for the shelter and for our contracts to continue, so we can both be there from April until the end of the year to carry on our key work and our case referrals with the guests who have left the shelter. Our main chunk of money comes from grant bodies, so trusts and charitable funds, but we also get donations and people do fundraising activities for us, like running a marathon, which is fantastic! “At the moment we are trying to get the funding for April to December 2016, while attending conferences and national events on behalf of CARIS to learn more about the sector and going to training about welfare reforms because they constantly change”. What makes the shelter such a good opportunity for homeless people, is the time they get to sort themselves out and in some cases look for a job, by not having to worry about accommodation and food for a while. “ The night shelter gives people the breathing space to look at what they really need. It is a safe environment monitored by the volunteers for twelve hours overnight. “There are examples of people who managed to get an accommodation while being in the shelter and are now going to work every day. We have at least two or three of them every year”, Rachel said with a warm smile. “I was unfortunate to have lots of different things happening to me at once. Doctors at the hospital told me it was a minor breakdown, but I am a performer and know how to put on a front and so, came out of hospital to nothing”. Belinda had no choice but asking for help to some friends who let her sleep on the floor for some time. During her over three years of homelessness she experienced all sort of shelters and even spent one week on the night buses as she had nowhere to go. “I remember getting to Union Chapel with few belongings. Being from a middle-class background, it was not really easy. There were twenty four small camp beds, all in one room, with screens around the two women’s beds, noisy flooring and forty plus people there for dinner. It was manic and I wasn’t very happy but I knew the church was somewhere safe and warm to stay, I could eat, drink and use the facilities. “The key worker came over to calm me down and said that I would not have a problem. I did not sleep much that night and ended up doing crosswords and talking with the person who did the night shift”. Things went better from the second night onwards, when Belinda moved to Christchurch Highbury, smaller and quieter than the other venue. There she met Jackie Mair, the chair of CARIS Islington, with whom she is still in touch. “In CARIS we are supposed to stay for four weeks but they let me spend a longer period of time. Afterwards the coordinators allowed me to join the night shelter a couple of days a week as a volunteer myself and I am still helping them! 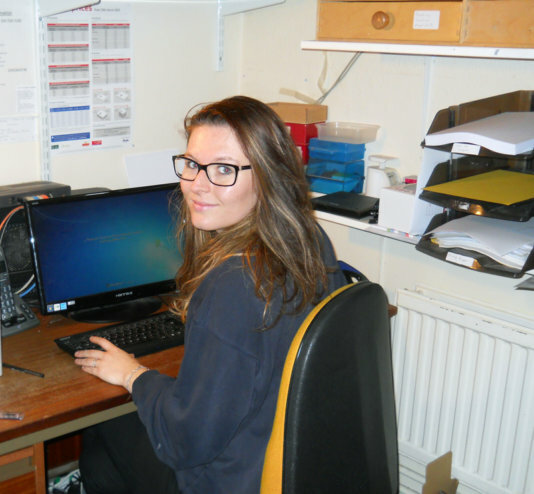 “The best thing about CARIS was realising how wonderful and supportive all the volunteers were. I also met friends at the night shelter and still see two of them once or twice a week”, Belinda explained. “ I have been living in a flat for three and a half years and have various little jobs now: I clean two churches, work with pensioners and run a singing group at St Stephens, which I love. I also sing within a mental health centre and I only got into that because I used to do their administration”. “It is much better than before, but I am not back to my previous life and it can be hard to make ends meet; I would not go back to my previous job, though. I would like to work either with the elderly or with the homeless on a part-time basis, so the rest of the time I could sing and bake. In fact, I make a bit of money from baking . “I am a very different person and I have my moments: little things set me off sometimes. But I am definitely stronger than I was and CARIS has supported me a lot during those hard times”. More than 2,700 people slept rough on any one night in 2014 in England. Rachel Smith at her office, one of the two shelter coordinators, along with Mark Brennan.